The choice of equipment, recording techniques and mastering software we utilize is different from a rock and pop focused recording studio. Large mixing boards and vocal microphones are seldom the right match for live classical music. Instead, we employ some of the best microphones in the industry that are suited for classical music such as Schoeps, Earthworks and AEA. Many live classical concerts use a variety of instrumentation and styles throughout the performance that can be challenging to capture. 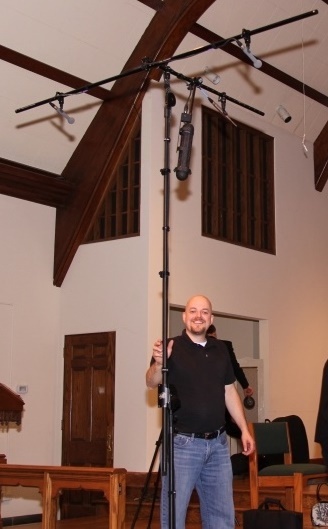 Our approach is to arrange an array of microphones recorded on separate tracks. This flexibility allows you to choose which recording you like the best. Our goal is to provide you with an immersive recording that sounds like the best seat in the house. We also utilize battery backups and record to two separate recorders to minimize the likelihood that power or equipment failure will impact your live recording. If you don't have your own recording space, we can help. Several concert venues are available throughout North and South Carolina that we can arrange depending on your ensemble size and musical style.